Tax season is upon us and with it the risk of identity theft. Although a company is at risk of cyber attacks and identity theft year-round, fraudsters are more likely to steal your information during tax season. This is because fraudsters can use your information to access financial accounts, gain credit, and steal tax refunds. Companies especially need to be on their guard because they're protecting not only their own information but also their customers'. To help keep your company and your customers safe this tax season, consider the following tips and tricks to increase your security. If your company deals with sensitive information, you most likely have a security policy in place to prevent employees from unknowingly giving information to hackers. However, it's a good idea to remind your employees and colleagues about phishing emails during tax season. Phishing emails aren't always easy to spot. A clever fraudster may claim to be a higher-up demanding personal information in a short period of time. It's for this reason that it's important to have a security policy in place for these kinds of emails and that your employees understand what to do if they're put in this type of situation. Some companies choose to incorporate a clean desk policy around tax season to prevent important documents from becoming lost or stolen. Whether you decide to create this type of policy or not, it's crucial to your security that you keep paper documents securely locked away after hours. Cyber attacks give many employers the idea that security breaches happen online, but most information in identity theft cases have been obtained through printed documents. Document management systems can do more for your company than reduce paper waste. They can also reduce the risk of identity theft by securing important documents in one electronic document management service. 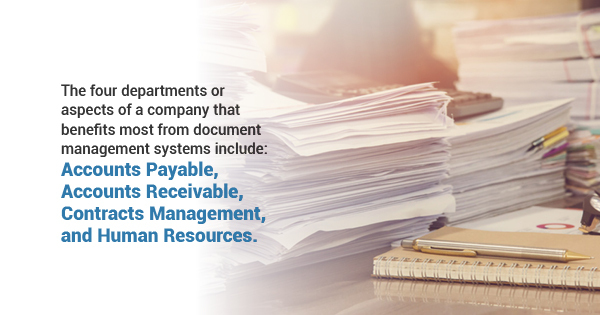 The four departments of a company that can benefit the most from a document management system installation include Accounts Payable, Accounts Receivable, Contractors Management, and Human Resources. Each of these departments is vulnerable to cyber attacks and identity theft without proper security. Whether you're looking for electronic document management systems or managed printing services, A and B Business Services has what you need to reduce paper waste and control your printing devices. To learn more about our document management software and managed print services, contact A and B Business today.